This diverse easy to only moderately difficult, 4.5 mile point-to-point traverse along and over Sleeping Giant (Nounou) Mountain is a surprisingly rich learning adventure. This four to five hour trek takes you through dense forests of native and exotic plants to a grassy picnic site near the mountain’s 1,250-ft summit for panoramic views of much of the eastern half of the island. Along with a direct view Kauai island central Mt. Waialeale – one of the planet’s rainiest places – you will learn how Kauai’s geologic history actually controls the island’s climate and resulting unique ecosystems. The Wailua River region, directly below “The Giant,” was the home of Kauai’s ruling chiefs. Archaeological remains of the Wailua Heiau Complex (shrines and ceremonial sites) makes this location ideal for discussing the island’s ancient cultural history. 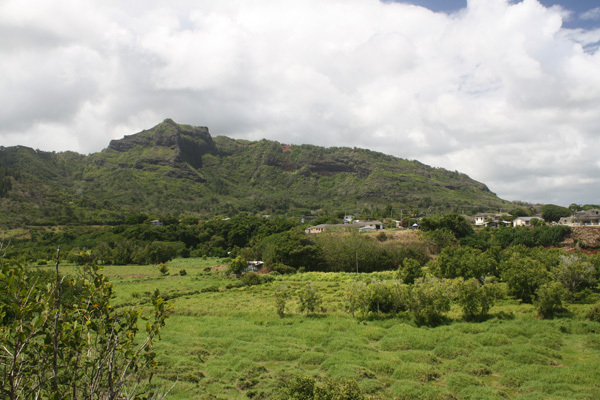 Intriguing as well are the many myths pertaining to the reclining “Giant of Wailua,” as portrayed by the mountain’s profile. Our van leaves Poipu at 8:30am, makes pick ups at various locations, and returns by mid-afternoon. We supply a delicious lunch with fresh fruit, snacks and bottled water. We recommend study footwear (tennis shoes, lightweight hiking shoes) and that you be prepared for some sun (hat, lotion, sunglasses).